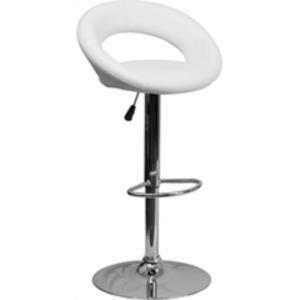 The orbit shaped support and round seat of this adjustable bar or counter stool is upholstered in a durable, easy to clean vinyl upholstery. The height adjustable swivel seat adjusts from counter to bar height with the handle located below the seat. The chrome footrest supports your feet while also providing a contemporary chic design. To help protect your floors, the base features an embedded plastic ring. * Please call us with any questions you may have about our white vinyl stool in the San Francisco Bay Area.